Description: For too long there has been an unquestioning acceptance that Britain's economic decline began long before the First World War. 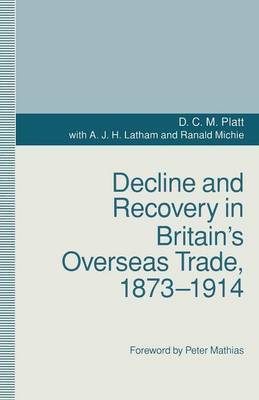 By focusing on international trade in the 1873-1914 period this book analyses the facts behind this myth, examining Britain's performance in comparison with that of its major rivals in the very areas where they came into competition with each other. What emerges is a much more complex picture of both losses and gains, in which Britain's position gradually adjusted to a changing world economic order, and appeared to be doing so remarkably successfully. For too long there has been an unquestioning acceptance that Britain's economic decline began long before the First World War. By focusing on international trade in the 1873-1914 period this book analyses the facts behind this myth, examining Britain's performance in comparison with that of its major rivals in the very areas where they came into competition with each other. What emerges is a much more complex picture of both losses and gains, in which Britain's position gradually adjusted to a changing world economic order, and appeared to be doing so remarkably successfully. Enter the details of an online store that carries ISBN 9781349109609 below. The store's URL must go to a valid product page that has the product displayed with pricing information.